This issue affects many of our members in Eastern Ontario. Note: This map is illustrative only. Do not rely on it as being a precise indicator of routes, locations of features nor as a guide to navigation. Algonquin communities are located in the general vicinity of: Ardoch, Bancroft, Golden Lake, Mattawa, North Bay, Ottawa, Sharbot Lake and Whitney. The Algonquin land claim covers a significant area of 36,000 square kilometres or 8.9 million acres within the Ottawa and Mattawa River watersheds. 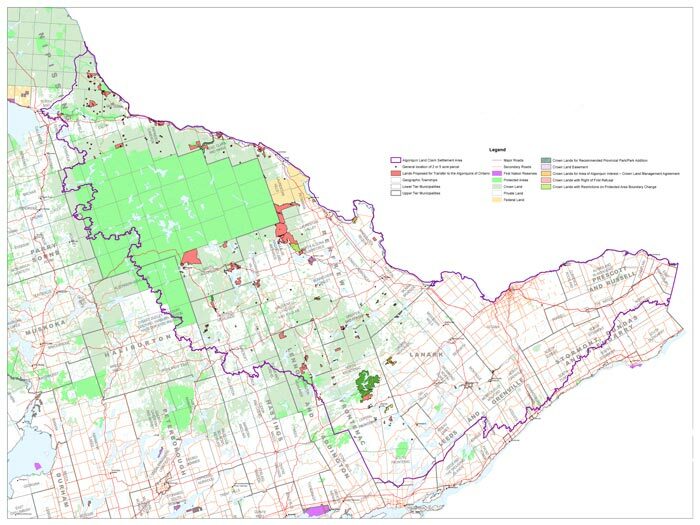 Approximately 59 per cent of the claim area is privately held patented land, 21 per cent is within Algonquin Park, 16 per cent is provincial Crown lands, and four per cent is federal Crown land. More than a million people reside and work within the claim territory. The settlement under negotiation may ultimately lead to new economic or land development initiatives, revised approaches to fishing and hunting, and other matters impacting waterfront property owners and adjacent lands. Click here to link to the Ontario Ministry of Aboriginal Affairs online pages about the Algonquin Land Claim.